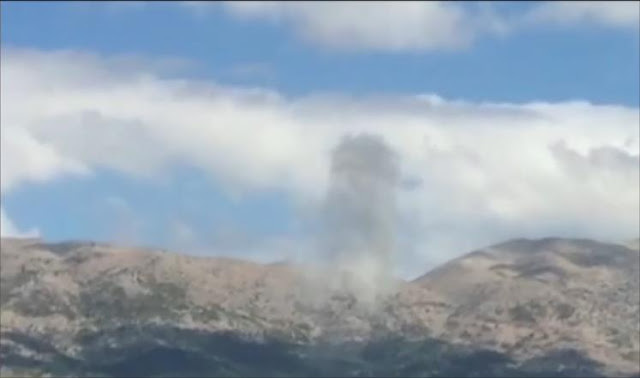 Israeli air strike targeted -aleom Alohd- a mountainous area near the southern town of Saghbin in Bekaa - Lebanon. The Lebanese authorities have started investigations on the raid. The Israeli warplane dropped a missile on a hill south of the town Saghbin on the eastern slopes of the western chain of the mountains of Lebanon, where clouds of smoke billowed from the target area. Prior to this air raid an intensive Israeli reconnaissance aircraft flight was witnessed over Mount Sheikh Western Heights and different areas of the western Bekaa. For its part, The official Lebanese news agency reported hearing a loud explosion between the town and Mount Saghbin Baroque but did not know its causes, pointing out that the hearing a loud bang accompanied by a flight of warplanes. The correspondent said that it is difficult even to talk about the nature of the goal targeted by the Israeli raid moment, while the Lebanese army and security forces began to conduct patrols in the area to see the target.